It played out like an epic, and they treated it as one. The North Carolina players flooded the court as one collective wave, sinking into each other's arms like newly crowned national champions. It was a celebration more befitting of March or April than January, but they reveled in victory all the same. They came together near midcourt as two distinct parties: those who laughed and those who cried. Jamie Cherry, the veteran, belonged in the latter. She had faced Duke six times in her trying four-year career. Six times, she had fallen short. This time, she fell into the arms of Paris Kea, the hero, whose 36 points and game-tying three-pointer to end regulation lifted the Tar Heels (14-6, 4-3 ACC) over the No. 15 Blue Devils (15-5, 4-3 ACC) in Sunday's 92-86 overtime win at Carmichael Arena. It was Kea's shot with one second left in regulation that vaulted North Carolina — which overcame a 19-point deficit and fought back from down eight in the final minutes — into extra time, where a 20-point overtime outburst was too much for a heavily-favored Duke team to overcome. It was, arguably, the biggest win in three years for this program — defined by a shot that will forever live in highlight reels and oral histories of this storied rivalry. "Thank God it went in," Kea said. She knew it was good from the moment it left her hands, as did the nearly 4,700 spectators in Carmichael Arena. But such fortune felt unattainable for this group. They deserved it, sure, a lucky break in an era full of bad ones. But even a perfect shot seemed destined to fail on this stage. It always had before. Too dramatic? Hardly. Before Sunday, the Tar Heels had blown leads in all three of their ACC losses and nearly done so in their three wins. They haven't secured a winning record since 2014-15, before the final members of their sterling recruiting class of 2013 transferred away. Their biggest win since then — an ACC Tournament triumph over Pittsburgh last season — was rewarded with a lopsided loss against Syracuse that erased any momentum heading into this year. None of these Tar Heels were on the roster in 2014, the last time North Carolina beat its archrival. A year ago, the Blue Devils left Chapel Hill with a 24-point win in the regular-season finale, writing the epitaph on a second consecutive losing season for UNC. "We've been through a lot the last three years," said Sylvia Hatchell, the head coach. "We didn't create the mess — the mess created us. And I had to deal with it." After a pregame celebration honoring her 1,000 career victories, the Hall of Fame coach had another mess on her hands in the second quarter, when Duke built a 19-point lead in the second quarter behind 16 points from Lexie Brown, the ACC Preseason Player of the Year. It felt like another mid-game collapse for a Tar Heel team all too familiar with blown leads and blowouts. Adversity, that fickle foe, was back again. But North Carolina responded with a vengeance. After a lethargic loss to N.C. State on Thursday, Hatchell preached to her players in practice about staying engaged, lest they plummet in the ACC standings for the third year in a row. On Sunday, she reiterated her message in the huddle. "This is the most important game right now," she'd tell them. So, with its season slipping away, UNC showed its resilience. Leah Church, the sharpshooter, skied a three-pointer with 3:13 left in the quarter to spark a 20-2 run spanning two quarters — highlighted by a Kea dribbling-clinic-turned-layup-drill to beat the halftime buzzer and punctuated by a corner three from Church to cut the deficit to one. With the crowd behind them, these Tar Heels were alive. "Y'all having fun?" Hatchell told her team. "We're gonna win this." Duke furiously tried to stave off the scrappy UNC squad, but the Tar Heels wouldn't die. They threw zone looks at the Blue Devils, disrupting their offensive rhythm after intermission. They attacked the passing lanes, forcing nine first-half turnovers and 17 in the second half and overtime. They shot over and between Duke's zone defense, hitting a season-high 13 three-pointers. Meanwhile, the Blue Devils went cold from the free-throw line and couldn't hold onto the ball, at one point dropping it on a simple inbound play. It almost felt scripted. "They punched at us," said Joanne McCallie, the rival coach, "and we got outside of ourselves." The Tar Heels trailed by eight with 2:15 left, but Kea served the visitors a heavy diet of mid-range jumpers, driving into the teeth of the defense and changing her release point with ease. With nine seconds left and a two-point lead in tow, Duke's Rebecca Greenwell — who tied her career high with 30 points last year in that 24-point win — missed the back end of a pair of free throws, giving North Carolina one final shot to tie the game. That shot, of course, was one of lore. It was drawn up for Church, who peeled around a screen at the top of the key, but Duke denied the red-hot reserve. So Kea called for the inbound, rose up in Brown's face and buried the triple — sending the game to overtime and Carmichael Arena into hysteria. Her teammates soon mobbed her at midcourt, as they did Cherry when the final buzzer sounded in overtime. They all came together: Kea, the former Vanderbilt transfer whose career-high 36 points reminded everyone of her All-ACC acumen. Church, the seldom-used freshman whose 19 points shattered her previous best. Cherry, the selfless senior whose 13 assists marked a new high in her final home game against Duke. For once, in the face of their bitter rivals, they all had something to cheer about. "It got a little emotional," Kea said. "Who doesn't love beating Duke?" It wasn't a win above reproach. Despite 12 rebounds from Janelle Bailey, the freshman phenom, the Tar Heels were dominated on the boards, 41-27. They made three more field goals than the Blue Devils despite taking 17 more shots, and they missed nearly as many threes as Duke attempted. But, frankly, who cares? On a day when Hatchell hosted a room-full of recruits, North Carolina showed promise for the future. 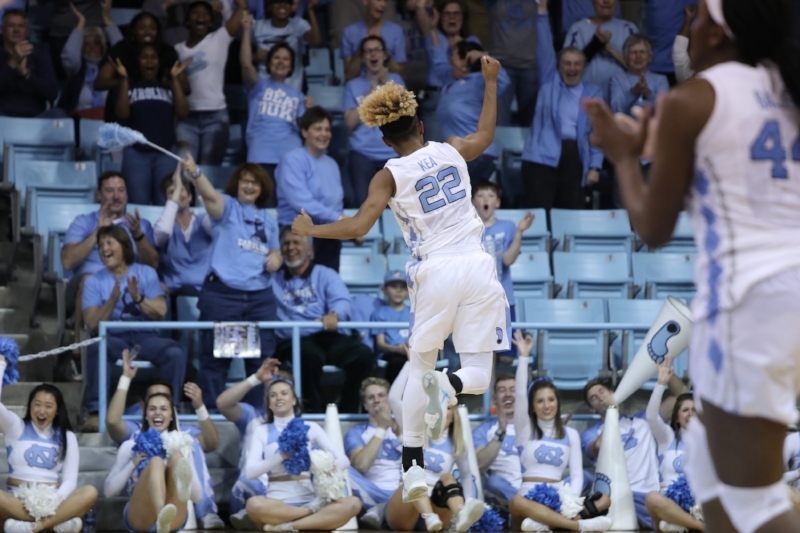 The Tar Heels now have more ACC wins than they did all of last season, and they finally displayed what their ceiling can be when they pair focus with talent. "We've got greatness in front of us — just like today," the coach said after Sunday's win. "Today was greatness, and we're just getting started with that." In the midst of three mostly inconsequential seasons, it was a day they'll never forget. Nobody in that arena ever could. Janelle Bailey made her presence known for UNC women's basketball.